According to an infantryman in the Ninth General Hospital in New Caledonia: “Much as it pleased us to see our bombers and fighters up there working for us, the only time we actually cheered was when we sighted a C-47. That meant food, mail, care for the wounded and all the things we’re fighting this war for." Many people when they think of military airplanes think of only bombers and fighters, but there is a third type: the cargo plane. The C-47 was so important that General, and future President, Eisenhower wrote in "Crusade in Europe:" "Four pieces of equipment that most senior officers came to regard as amont the most vital to our success were the bulldozer, jeep, 2 1/2 ton truck, and the C-47," and this was the only aircraft he mentioned. Flying cargo planes was more dangerous than being in a fighter or bomber, because the C-47 was a large target; slow (150 MPH); a valuable target becuase it carried airplane fuel, torpedos, guns, supplies, and important people and messages; had no protective armor (no thick steel plates in the walls by the pilots); and it was unarmed. How many people would like to fly one of these into a battle area? Very few. These pilots also faced another and often more deadly force than enemy aircraft: the weather. Fighters and bombers usually flew only in good weather, and had oxygen to climb above low storms. 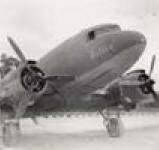 But C-47s took off regardless of the weather - the supplies and mail had to go through. Because it did not provide oxygen for the passengers, they also had to stay below 12,500 feet. Many aircrews lost their lives due to encounters with bad weather and mountains. Flying cargo planes in the South Pacific, an area known for intense storms, long distances over water, and mountainous islands, may therefore have been one of the most treacherous flying positions in World War II. This website is dedicated to preserving the memory of one of the first military transport squadrons, and arguably the best ever, the U.S. Army Air Corps 13th Troop Carrier Squadron, also known as the Thirsty 13th. Their history is now available in a highly-detailed 800-page, book, The Thirsty 13th, which may be purchased by following the link below. Guests may hear voices of many members as they introduce themselves by clicking below on "The Story Tellers." Click below on "The Plane" to learn how one of the first 13 aircraft they flew to the South Pacific in 1942 began restoration to bring people literally in touch with the squadron 70 years later. After these sections are links to several movie clips related to the Thirsty 13th. Instead of clicking on a link below, you may also simply scroll down the page. A roster of enlisted men in the squadron overseas through May 15, 1945, is here. A roster of all of the officers and enlisted men still in the squadron September 22, 1945, is here. The order sending 172 ground crew members to the San Francisco Port of Embarkation is here. The Thirsty 13th was one of the first U.S. Army transport squadrons, and the very first in the South Pacific, an area unique for its combination of long distances over water, mountains, and challenging weather. The 13th Troop Carrier Squadron arrived in New Caledonia at the critical time in World War II’s battle for Guadalcanal, the turning point in the Pacific War. It delivered to the Marines supplies that were key to holding the island. It went on to support six more battles, in the Northern Solomons, the Bismarck Archipelago, the Western Pacific, New Guinea, Luzon, and the Southern Philippines. It was also one of the three (and later five) transport squadrons for the Thirteenth “Jungle” Air Force, moving their fighter, bomber, and other groups to forward positions. The squadron’s accomplishments were recognized by twice being awarded the highest honor a military unit may receive: the Presidential Unit Citation (Army). It also received many commendations. The Thirsty 13th may be the #1 transport squadron ever, based on its safety record. In three years of flying 9.7 million miles, almost entirely over water, through often terrible weather, the squadron lost only one load (of 17 passengers) entrusted to it. The squadron had four main overseas camps, marked at right with green pins, being (from right to left): Tontouta, New Caledonia; Espiritu Santo, New Hebrides; Biak, New Guinea; and Dulag, on Leyte in the Philppines. The air echelon was based at these and also four additional camps, marked with yellow pins: Plaine des Gaiacs, New Caledonia; Los Negros in the Admiralty Islands; and Wakde and Noemfoor, New Guinea. Pictured above is the line at Tontouta Air Base in New Caledonia. Pictured below are the squadron work buildings and two of its C-47s at Mokmer Aerodrome on Biak Island. Attention-getting page layouts – click on the sample pages below. Others interested in history and the South Pacific. To read reviews of the book, including by people with no relatives in the squadron, click here. As of January 12, 2019, I was out of books, but might get some back from as museum to which I donated 96 books, if some are unsold. I also may make a second printing, or create a second edition. Therefore, if interested in a book, please contact me so I may add you to a list of people interested in getting a book. I plan to put a PDF of the book online for free at some point, so: a) if the number of offspring of a man increases in future generations, every descendant can have a copy, instead of the book going down one family line, b) it will remain in perfect condition, and c) it will all show up in online searches, e.g. if someone does an internet search on "Pekoa," the airfield in Vanuatu, they will find all the Thirsty 13th photos and history. I am waiting to put it online until I decide wheteher I will create a second edition, because I want only one edition online. In the meantime I can email you PDFs of pages from the book showing the exact locations of the camps where your relative served, and other relevant pages. I also have hundreds of orders, and about 5,000 photos, and can email you those about your relative. Therefore if you are related to a member of this squadron, please contact me at (212) 289-1506 or email me at sethpw1@gmail.com. Thank you. To hear some of the story teller's voices, please click here. You may have to click at the top of your browser window "Allow blocked content", and may be asked to install Microsoft's Silverlight product, both of which actions are harmless. Several movie clips were found relevant to the Thirsty 13th. They were uploaded to YouTube and may be seen in an separate window by clicking on any of the following links. Be sure to click FULL SCREEN mode to completly enjoy them. Russell Islands' Renard Airdrome and Thirsty 13th C-47 Sweet Leilani - This C-47 joined the squadron in May 1943, and is shown on the first island west of Guadalcanal, to where the squadron flew in June 1943. Tontouta Flight Line, Takeoff, Landing at Munda - the squadron line in 1943, and a takeoff from New Caledonia by a Marine crew, and loading wounded at Munda. Rendova Island - the Northern Solomons in color. Transporting the movie - featuring the Thirsty 13th unloading movie reels brought to Bougainville in late 1943 or early 1944. Ending minutes of the Bob Hope Show - this was seen by Thirsty 13th members in August 2-3, 1944, in New Hebrides. 6a. is C-47s landing at and departing from Biak, estimated at Borokoe aerodome. Wakde and Biak Camps, Formation Flight - actual color movie footage from 1944-45 by squadron pilot Graham Rice. Typical Air Crew, Peleliu, and Biak Aerial - An unrelated air crew, but representative of the inside of a C-47. Then airfields Peleliu and Biak to where the squadron flew. Drop Missions - The Thirsty 13th first made these in November 1942 to Marines on Guadalcanal, and then to units in the Northern Solomons, New Guinea, and in the Philippines. This is a short movie of a similar run, in 1942 by the Air Transport Command. Drop Missions with Parachutes - includes footage over Bougainville in the Solomons potentially by the Thirsty 13th. Two Down and One to Go - a 1945 movie seen by squadron members at Biak, about the Axis threat to the United States and the US response. Thirsty 13th 70th Anniversary Reunion - Left-seat flying in Texas on November 4, 2011 by six 1943-1945 pilots. 13th TCS C-47 Lady Eve on Henderson Field, Dec 1942 - Loading at Henderson Field - first 2 minutes only; not in rest of movie. Download a copy of the squadron's 1946 yearbook, "Two Years c/o Postmaster" in two parts, by clicking here and here. The squadron operated 43 C-47s overseas. This is the military version of the most popular airliner at the time, the DC-3. Of these 43 C-47s, 23 were lost to: 2 fatal accidents, 4 non-fatal accidents, 6 accidents by others after the war, and 11 were scrapped after the war. Of the other 20, 19 have not been found, but one, pictured below, was found. 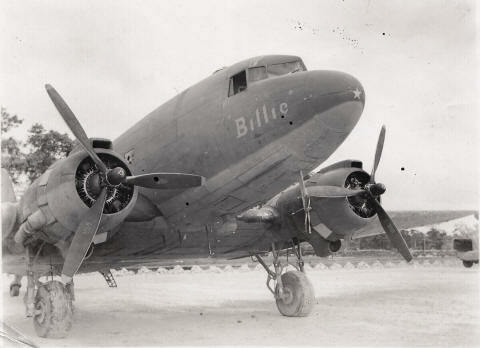 It was one of the original 13 C-47s the Thirsty 13th received in the U.S. September 20, 1942, #41-18590, construction number 4715, and was named Billie. It is pictured below left at Espiritu Santo's Pekoa airfield estimated in November 1943, and below right in Puerto Rico in 2009. The book and website author Seth Washburne purchased Billie on January 19, 2010, and flew it (as copilot) from Puerto Rico to Fort Worth, Texas, where he hired a team to restore it. The restoration did not go well, and Bllie's parts are now in a hangar in Lancaster, Texas. To read more about this, please click HERE. The restoration of Billie was held up while I pursued legal action against Jim Terry and others, which, sadly, introduced me to lawyers who were worse crooks than Jim Terry. I need to make some documents avaialbe to a court, and so provide a link to these, and other disclosures (non-positive stuff I don't want to take away from the Thirsty 13th story) here. On July 31, 2013, Thirsty 13th LLC purchased building 880 at Lancaster Airport (LNC) in Lancaster, Texas, with three 70 foot x 70 foot bays. Billie is in the middle bay, and the two side bays are leased. For a video of the site, please click here. For photos of the available unit please click here. Several people have expressed an interest in donating to the cause. Truthfully I am spending a considerable amount on legal fees regarding the restoration of the airplane, and until that suit is over do not feel right accepting any financial contributions. Also I plan to rcreate a 501(c)(3) non-profit at some point to accept tax-deductible donations, but this has not been created yet. In the meantime the greatest gift anyone can offer is to search for items which might add to the squadron history, or try and remember and share stories. Or simply send a nice thank you email. These are what make me very happy! Recent Events: Click here to see photos from the 70th Anniversary Reunion, in Fort Worth, Tex., November 4-5, 2011. Subsequent to publishing the book "The Thirsty 13th" additional squadron history has been learned. This history, and history-related items, were shared in several updates emailed to squadron members, relatives, and friends. Click on the links below to enjoy these history updates. 2013-11 November Update - Color photos of Northern Solomons airstrips; the Thirteenth Air Force Inactivation ceremony. 2014-05 May Special Update - about the discovery of the engines of a PBY that beached on coral to rescue Captain Cecil Petty. 2014-07 July Update - lots of history and history-related information, including the location of the camp at Noemfoor. 2014-11 November Update - including beautiful color photos of the New Caledonia camp in 2014, and the camp location at Clark Field. 2015-04 April Update - including the Dumbéa temporary camp location, and Sydney rest leave sites in 2015. 2015-05 May Update - great items from Goldstein, and other Florida visits. 2015-08 August Update - with related Marine squadron items, more great photos. 2015-11 November Update - photos of New Caledonia, Vella Lavella, new squadron plaque, much more. 2016-03 March Update - New Caledonia railroad tunnels, Philippines color photos. 2016-05 May Update - Sydney rest leave location, Biak diary notes, Dulag camps of 63rd and 64th troop carrier squadron. 2016-07 July Update - Wimpy's on Russell Island, Morotai airfield layout, 1945 C-46 crash site. 2016-08 August Update - Drew Field photos, radio operator stories, search for the Lana T.
2016-12 December Update - Wakde bomb shelter, Biak camp, James Claydon background. 2017-02 February Update - API story Manus to Munda; Biak camp, finding men and relatives..
2017-03 March Update - Bob Hope short snorter, Donald Pyke war stories, finding men and relatives. 2017-04 April Update - FEAF combat time boundaries, move to Dulag, Philippines, Japan, finding men and relatives. 2017-05 May Update - Western Scanning Trip, stories, Grand Pacific Hotel Suva, 403rd Group order September 22, 1945. 2017-07 July Update - Typical flights 1943-44, Biak camp areat today, Dulag, 63rd TCS transferred to 13th TCS Nov 1, 1945. 2017-09 September Update - Results of Part 1 of a 3-week scanning trip. 2017-10a October Update 1 - Results of Part 2 of a 3-week scanning trip. 2017-10b October Update 2 - Results of Part 3 of a 3-week scanning trip. 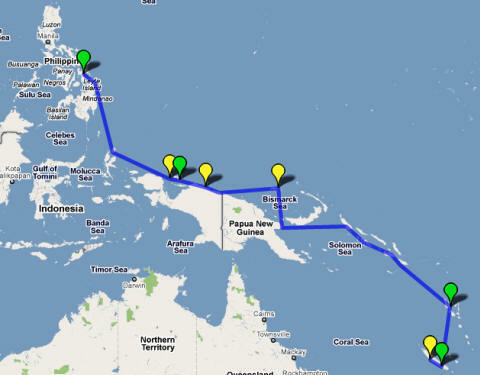 2017-11a November First Update - Pilot and navigator 1942-43 landmarks from New Caledonia to Munda, Auckland, Tonga. 2017-11b November Second Update - Camp Stoneman barracks location, and the ferry to Fort Mason. 2017-12 December Letter - 1942 convoy to the South Pacific, identifying more members. 2018-01 January Letter - Stirling Airfield photo, Biak photos, reaching relatives of 35 more members. 2018-02 February Letter - Photos from Biak, stories from pilot George Laycock, aerial views of airfields at Dansalan (Marawi City), Malabang, Parang. 2018-03 March Letter - Russell Islands, Pekoa, aerials of Mindanao airfields Anakan, Bahi, Farm 7, and Padada, and Sanga Sanga on Tawi Tawi, Palawan. 2018-04 April Letter - C-47 Lady Eve, Marines flying our planes, diary of Lenard Davis. 2018-10 October Letter - Clark Field Zero on pole, New Caledonia jeep, original patch, Bill Alexander letters, items from Cady, Kulikoff. 2019-01 January Letter - Items from Elam, Saltsman, Alexander, blue-bordered patch..
2019-03 March Letter - Items from Powell, Hershberg (including a new patch design), Groesbeck and Aos. Three PDFs of additional research are available here. PLEASE NOTE that the typestyle will appear much clearer if you download the PDF to your computer, and then open it as a PDF, rather than trying to read it in your Internet browser. Oshkosh 2015 Presntation "Research a Military Unit" - about book writing techniques. Download a PDF about a B-17 (with my uncle as co-pilot) shot down over Germany July 31, 1943 here. Download a PDF (this will make it easier to read than reading it in your browser) about a U.S. Navy C-117D (# 017152, with my brother as a passenger) that ditched off of Guam August 14, 1978 by clicking here. As always, any feedback or comments on these PDFs will be greatly appreciated. This website, book, airplane restoration, videos, and events were the idea of Seth Washburne, pictured at right, on the right, with Thirsty 13th 1942-43 pilot John Blankinship. Seth is the son of Thirsty 13th 1942-43 navigator John Washburne. I am always eager to learn more about the squadron, so if you have any information you would be willing to share, it will be greatly welcomed. I also welcome correspondence from others who have an interest in the Thirsty 13th. I may be reached at seth@thirsty13th.com. You may also call me at (212) 289-1506 (mobile). This page was last updated on November 25, 2015.